Before we purchased our current house I never in a million years thought I wanted a new-build home. And even now, I do spend rather too much time searching online for the ‘character’ house that will be our next purchase. It’s not gonna happen any time soon unfortunately – but a girl can dream. But there’s a lot to be said for a house that no one else has inhabited. You don’t have to undo any decorating disasters for a start. You don’t have to live with garish wallpaper, dated tiles or flowery carpets while you save the pennies in order to have them replaced. What you do get is a layout that already suits 21st Century living. A utility room if you’re lucky. More than likely an en-suite to the master bedroom (I can’t tell you how much I love this feature), and the chances are you’ll have a garage to hide all sorts of nasties from sight. Forget the car going in the garage, you’ll have off-street parking anyway. It also means a energy-efficient house, lower heating bills, no drafts, windows that open and close easily (bliss if you’ve ever lived in an old house), and because everything is new all at once, a few months of feeling like you are on holiday. And, (depending on your builder) you may have been able to choose bathroom tiles, flooring, appliances and even garden shrubs in advance. So ripping out bathrooms and kitchens can stay firmly in the past, with all the upheaval that that entails. All you have to do is put your own stamp on the place with some fairly easy-to-do decorating. But in reality I know that this can sometimes result in complete panic and indecision. Without any pressing need to change anything, you’ll be amazed at how many people continue to live for years with magnolia walls and beige carpet because they simply don’t know where to start. Always a good idea. This is the perfect opportunity to devise a decorating scheme that flows from room to room without sudden changes of style or colours. There’s nothing wrong with that of course, but consider this the time to really work out what your style is and stick to it. Create a moodboard that will include colours, textures and concepts for the whole house, not just one room. Use inspirational photographs, paint samples and fabric swatches to build up a picture of your true style. It’s a good idea to leave decorating a new house until the plaster has settled and all the snagging has been done anyway, so you’ll have time to perfect this over a few months. And it doesn’t mean that every room will look the same. You can change colours from room to room but make sure they come from the same colour spectrum (in fact the manufacturers colour cards are perfect for this – there’s a reason why the paint companies put certain colours together) and of course this can be flexible. Just make sure that before making any big decisions, you refer back to your original moodboard and ask yourself – would it look out of place if I added this now? Is the easiest way to change the mood of a room, and it’s fairly quick to do too. What’s more if you do paint a room, and decide it isn’t working for you, it’s easy to change. Don’t assume you have to paint a room all the same colour either. I’m not against a feature wall of colour but it really depends on the shape of the room, where the windows and doors are, which wall faces you as you walk into a room and what wall you are looking at when you are sitting down. 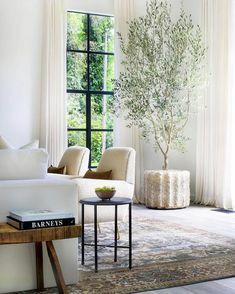 At home I have fairly square rooms on the whole and I’ve decided to paint two adjacent walls a strong colour in a few rooms, and two adjacent walls white. In the bedroom, which is rectangular with lots of sloping ceilings, I’ve painted the bottom half of the wall black, and the top half white. Consider what will work for you and your rooms. Are probably the first thing you will tackle when you move in, and covering them falls under the category of ‘necessity’ rather than ‘adding personality’ really. But I have to mention it here because nobody likes the neighbours peering in when sitting down to dinner. What you choose to put at the windows is a matter of personal taste, but if you’re looking for a quick fix, I’d advise simple roller blinds. 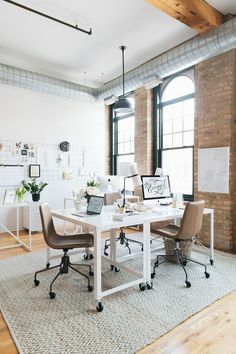 They are inexpensive and easy to fit and simple white voile roller blinds will solve the privacy issue and can be layered with curtains later on. But when looking for a long term solution, plantation shutters do tend to suit new style properties and windows. They also go with most styles of interior decor. Can make the most impact without a doubt. And when you are faced with rooms that have very little going for them in the way of structural details, wallpaper can add much needed texture and interest as well as colour and pattern. At home, we’ve only added wallpaper to the kitchen so far (I did say, so far). I’ve already written about my reasons here, but I will add, that it also originated from my original moodboard for the house too. I’d decided that the house would be a mixture of black, white, grey, brown (wood mainly) with accents of green. The green has become more dominant that the original plan but I haven’t strayed too far from it. Wallpaper doesn’t have to just mean pattern either. 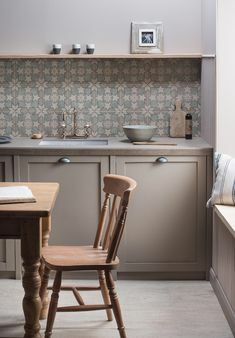 I know lots of people have an aversion to strong pattern, or any pattern for that matter, but a strong trend at the moment is to have wallpaper that resembles wood, stone, brick, marble or even concrete. All of these will add character where there is none. A new house often comes with acres of neutral carpet. Which is great when you move in, because you can just plonk your furniture down and not even think about it. Over time though, beige carpet can quickly become grubby, and even before that you’ll probably be bored to the teeth with it. The answer is to cover at least some of it with rugs. Rugs are an essential decorating tool anyway. Like wallpaper, they can add colour, texture and/or pattern. And they help to delineate a space too. Is your chance to add real personality and your own taste to a room. And there really is nothing worse than four blank walls. Before getting out the hammer though, spend some time deciding your style when displaying art. Do you favour random photograph galleries? Symmetrical grids of identical sized frames? Or one huge statement artwork. And consider the subject matter too. Galleries look best when the subject matter, or the frames, or the colours, have something in common. There are lots of sites online now that not only sell art, but suggest combinations of pictures, appropriate pairings, and even how to hang them. The biggest mistake to make when moving into new house is to to think everything in it has to be new. I’m not suggesting that all of your old furniture from your previous house will fit or be appropriate style wise, but there will be some things that can be incorporated. A room that consists of only new furniture will at best look like the showhome you visited when you first purchased the house, or at worst, a furniture showroom. A home needs a sense of history too. Furniture and accessories that tell a story are what makes a house a home. If you have trouble visualising your old things in your new house, ask a friend for advice. Sometimes it just needs a new eye to see what will work. Is often the downside of a new-build. In some the ceilings will be covered with down-lighters or there will be one bulb hanging from the centre of the ceiling. Hang the biggest, brashest fitting from that central pendant. Honestly, the bigger the better. 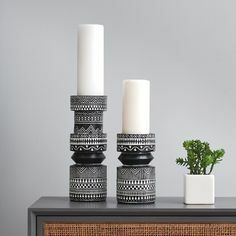 And then add as many table lamps as you can so that you never have to light that pendant. It’s just for show. 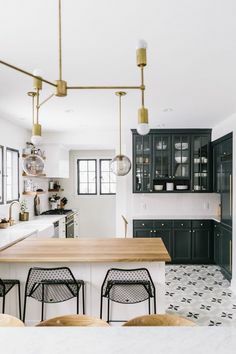 At home we had a couple of random pendants – one needs to be changed still to a downlighter – the other we have fitted with a long flex and put a couple of hooks in the ceiling so that we can hang a pendant over the dining table. Houseplants are not just a fickle trend. They did go out of favour for a few years but now they’re back and I hope they’re back to stay. 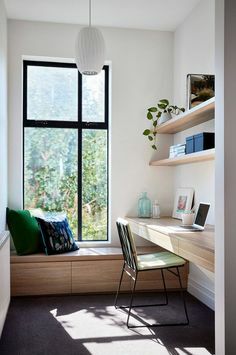 Greenery adds another dimension to a room scheme and makes it come alive. And don’t worry if you haven’t got a natural green finger – I certainly haven’t – faux plants look just as good as the real thing these days with the added bonus that they don’t need as much light to always look good. It’s true a garden does take years to mature but there are a couple of things you can do straight away. Faced with metres of brown fence at home, I had no choice but to get out the paintbrush and get to work. In fact it was one of the first things I tackled. Painting the fence has made so much difference to the garden and it’s the first thing visitors comment on. We’ve chosen grey but black would have been more dramatic and one day I might just re-paint it darker. The plants stand out more against these colours and it’s so much more restful on the eye. Secondly, plant up a few pots and containers to at least make the patio a bit greener when you’re sitting out. Before you know it these will have multiplied (not by magic I might add, you do need to actually do it) and your garden will start to look lush even. Couldn’t agree more with other comments! I had felt defeated by the fact my husband and I are going for a new build now instead of a character property (which was on the cards for so long! ), but having read this and seen your stunning home, I am stupidly excited by the idea of being able go into it as a blank canvas and not worry about the leaky tap or stripping miles of woodchip wallpaper! Great suggestions! I’m always thinking about adding character to my home, growing up in a French farmhouse with exposed stone walls and original timber beams galore… So this is very helpful to a budding interior geek 🙂 thank you! This is such great advice, Carole. I think a blank canvas can either be seen as a great opportunity, or a little bit scary! People don’t always know how to stamp their personality on a brand new space, so this is a great starting point. I never saw myself as someone who could live in a new build but having recently done my bathroom and kitchen I would actually relish the idea of a home that was already done. Also, as you mention, not having to undo someone else’s mistakes or poor taste. These tips are brilliant and I’m now sold on the idea of a new build.